Sometimes the second time is the charm. 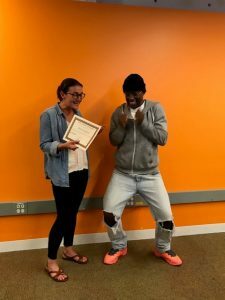 For Marcae, the first time he heard about New Door’s job readiness program and entered a cohort he was finishing his senior year of high school. He was not able to graduate New Door’s program on the first go around but that didn’t stop him from trying again. He remembers Shane, the Youth Development Specialist who encouraged him to apply for the program. At New Door, if a young person does not complete the program initially they are welcome to return and try again. Shane was also the reason he came back for his second attempt as he ran into Shane on the street after he had graduated high school and was looking for something more to get involved with. When he entered his second cohort he came in with a goal: to finish and finish strong. He set miniature goals for himself throughout the program, such as taking a leadership position in his group of 10. He mentioned wanting to step up and be a leader but also making sure he let others speak and lead as well. 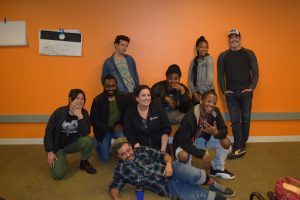 “Connecting with my cohort… a nucleus of people [different than me] helped me branch out, not only my personality but helped me give a little bit of me to them,” Marcae said. He remembers it being really refreshing to connect people that made him think and made him feel like he could speak his mind personally and professionally. Marcae interned at Off the Grid which is a food truck experience that clusters different food varieties together, allowing the guests to enjoy and try different options. He worked for the umbrella organization that put on the various Bay Area events: doing set up and breakdown, getting the food trucks in line, cleaning up, and communicating with the customers (sometimes even suggesting his favorite foods). While working at his internship, he participated in case management and attended weekly workshops to help with his career readiness. A piece of advice he was given from his case manager was to “stay on it,” meaning to motivate him to complete the tasks he needed to and to show up. He worked on public speaking, writing his resume, and found the budgeting workshop where he learned about taxes and credit very worthwhile. After finishing his time in the three-month program, which he is very proud of, he enrolled in barber college, hoping to gain his own financial stability and freedom. He would like to be working at a barber shop or even own his own in a couple of years, but he is waiting to get his barber license first. He believes that although he always had this drive in him, New Door put him on this trajectory and helped sharpen his tools and knowledge to give him the direction to pursue his goals.